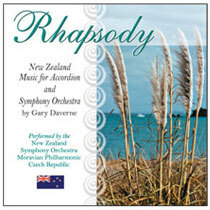 Rhapsody eTracks mp3 album of New Zealand Music for Accordion and Symphony Orchestra by Gary Daverne. A Musical Party was commisisioned by the New Zealand Accordion Association (NZAA) to commemorate their 30th anniversary in June 2001. The weekend and Musical Party was dedicated to Silvio De Pra, honouring him for his outstanding contribution to the accordion in New Zealand. He has chaired the Accordion Examination Board of NZ Inc. since its inception n 1972 and been orchestra and conducted by the composer, Gary Daverne. Musical Party was later revised and arranged for solo accordion and symphony orchestra. Accordion soloist Mary Tokarski - Moravian Philharmonic – Conducted by Petr Sumnik. Concert Waltz - This music was originally composed, as a commissioned work. Kevin Friedrich, one of the New Zealand's leading accordionists. 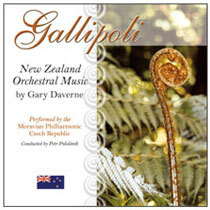 It was premiered by him, in Auckland, June 1993, with String Silhouette, an all female string ensemble. Accordion Soloist Bernadette Conlon - Moravian Philharmonic – Conducted by Petr Pololanik. The String orchestral backing was recorded in the Czech Republic and the solo accordion was recorded over the backing track by Bernadette at a later date, in Melbourne, Australia. It was then mastered and edited in Auckland. Rhapsody for Accordion and Orchestra - This work was commissioned by Auckland accordionist, Harley Jones, for performance in New York, August 1988, and was premiered in Auckland in 1987 by Harley with The Auckland Symphony Orchestra. In the first two years it received 36 performances worldwide and was recorded by the New Zealand Symphony Orchestra with Harley as soloist. Performed frequently internationally, several other recordings have been made of this work. Rhapsody combines the sensitivity, expressive and distinct tone colours of the accordion with the full power of a symphony orchestra. This performance with Mary Tokarski as solist, was recorded live in concert, 13 October 2005, in Olomouc, Czech Republic, with the composer conducting the Moravian Philharmonic Orchestra. The Gem of the Kaipara - This work is another commissioned work, this time by the Kaipara District Council, in honour of long time accordion and arts supporter and lifetime member of the New Zealand Accordion Association, the late Mrs Jenny Cocurullo. A respected and loved citizen of Dargaville, the main town in the Kaipara region in the north of New Zealand, Jenny always promoted the Kaipara as the 'Gem of the North'. She in turn was considered 'The Gem of the Kaipara'. Written for solo accordion with string orchestra and percussion, the Gem of the Kaipara was premiered in Dargaville on 11 May 2002, where it was performed by the Auckland Symphony with New Zealand accordion soloist Kevin Friedrich, and conducted by the composer. Written in simple sonata form, the introduction of the piece is quite mysterious in nature, with the lower strings providing a subtle bagpipe-like drone. The airy melody and soft percussive effects are reminiscent of the awakening of the lush majestic Kauri tree forests and countryside of the Kaipara Flats with its blanketing dawn fog. The main themes are written aroun Jenny's name and the name of the region 'Kaipara'. The lyrical re-occurring melody is first heard by the accordion with string accompaniment and then switches to the strings accompanied by the accordion. After working through an animated and rhythmical jig-like section portraying Jenny's boundless energy, various interests and Scottish heritage, teh strings restate the soaring melody expressing the vast expansiveness and sweeping landscapes of the Kaipara region. Accordion soloist is Kevin Friedrich with the Moravian Philharmonic, conducted by Petr Pololanik. Fireside Fantasies (Three Songs Without Words) - These three short pieces were originally written for choir and orchestra. They have been rewritten and recorded, featuring the solo accordion playing the melody and using only the right hand playing single notes. They have been renamed to avoid confusion with the choral works. 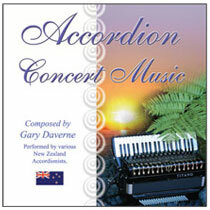 Accordion soloist Mary Tokarski with the New Zealand Symphony Orchestra conducted by Kenneth Young. Waltz for Stephanie - was originally composed for Stephanie Poole, while she was New Zealand Accordion Champion and principal accordionist with the Air New Zealand Accordion Orchestra. She premiered this work in Auckland in 1989. It was the title track for an album of accordion compositions by the composer, released that year. This was always one of the composer's favourite compositions. Studio strings have been added to the original recording. Accordion soloist Stephanie Poole with the Studio Strings directed by Gary Daverne. Shopping Centre Suite - These five character pieces were written for younger players. They are frequently used in competitions as individual pieces. 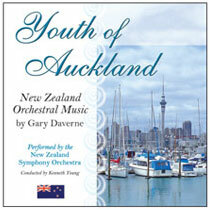 Youth of Auckland eTracks mp3 album of New Zealand Orchestral Music by Gary Daverne. This is a symphonic album except for Track 2 which features accordion soloist Harley Jones with the New Zealand Symphony Orchestra.